It’s March 31, 2015, end of another financial year. You must be busy managing your financial ledgers and documents, while analyzing the last year’s achievements and making targets for the year coming ahead. In between everything, droom.in has put its entire product category on sale. Yes! 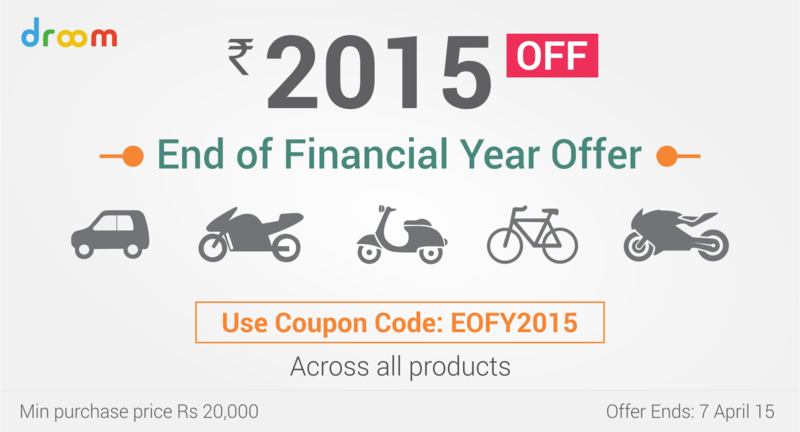 We are running End of Financial Year Sale providing amazing savings of ₹2015 on every order. Enjoy these savings on Used Cars, motorcycles, bicycles, scooters, and more, on minimum order of ₹20,000. Use droom offer code EOFY2015 to add savings in your cart. Here’s a great a way to spend that bo00! It’s a great opportunity for you to buy a great vehicle that fit’s in your budget and requirements. Being India’s first online marketplace to buy and sell automobiles, we have taken the responsibility to take stress out of every vehicle purchased or sold. Also make sure to check services including car cleaning and detailing and auto inspection to add value. Hurry offers valid for limited time only.